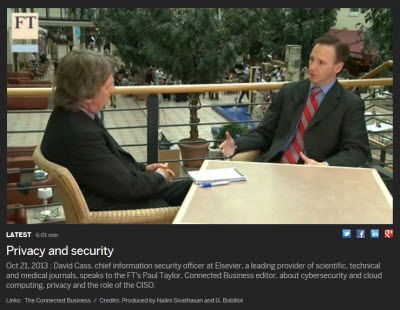 David Cass, Elsevier's Chief Information Security Officer (CISO), was recently interviewed for a video by the Finanacial Times' FT.com as part of their CSO Interviews series. The number of cyber attacks against companies doubled last year, highlighting how crucial the role of a company's chief information security officer is becoming. In this 6-minute video, David discusses cyber security and cloud computing, privacy and the role of the CISO in this environment. He talks about whether the cloud is making data more or less secure, and how Elsevier is taking a forward-looking approach to its CISO reporting structure. He explained that reporting into Elsevier's General Counsel enables his team to focus on privacy and security in partnership with Elsevier's technology organization. The interview is available on the FT.com website.